When your jaws do not line up properly, you may not like the way you look. It can be hard to smile, eat, swallow, or even rest your mouth comfortably. Even more concerning, misaligned jaws can cause health problems such as chronic joint pain (TMJ), headaches, sleep apnea, excessive tooth wear, and dry mouth. Orthodontics is usually the first step in correcting bite problems, but in some cases, jaw surgery (also called orthognathic surgery) is needed in addition, or instead of braces. It can be performed on the upper jaw, lower jaw, and/or chin. We wait until growth is complete for jaw surgery, which is ages 14-16 for women and 17-21 for men. We start with X-rays to evaluate your bite and jaw alignment. Then 3-D modeling and computerized imaging are added, so we can get a very clear picture of your condition, and what treatment options are indicated. If jaw surgery is recommended and you decide to have it done, you will probably need to wear braces for a while to get your teeth in the best position before surgery. We may use temporary anchoring devices to help move your teeth and shorten your braces time. Other preparations may be needed, such as teeth reshaping, crowns, or both. Prior to the procedure, we use virtual surgical planning (VSP) to make sure we know exactly how we are going to guide the jaw into the correct position. We conduct the surgery under general anesthesia in the hospital, making cuts in the jawbones and moving them into correct alignment. Then we put in tiny plates, screws, wires and rubber bands in to keep the bones in position. The screws, which are smaller than braces brackets, become part of the bone over time. In some cases, extra bone needs to be transferred from a hip, leg or rib and attached to the jaw with plates and screws. In other cases, jawbones are reshaped. You will stay in the hospital for 2-4 days. Complete healing can take up to 12 weeks. Then, you may need braces to finish aligning your teeth. This can add another year or more to the process. Jaw surgery is generally safe when done by an experienced oral and maxillofacial surgeon like Dr. Puckett, in collaboration with your orthodontist. But as with any surgery, there are risks, of course. These include blood loss, infection, and nerve injury. The good news is, virtually all the Wilmington Oral Surgery patients who have chosen jaw surgery have been pleased with the outcome. After recovery, they eat better, sleep better, smile better and feel better about how they look. What Does Jaw Surgery Cost? Without insurance, jaw surgery can cost $20,000 or more. The actual amount depends on the complexity of your jaw misalignment. 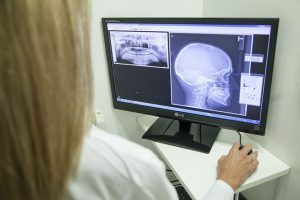 Some insurance companies consider orthognathic surgery medically necessary when skeletal abnormalities contribute to breathing problems, and also for some speech impairments. However, most insurance companies consider jaw surgery cosmetic or experimental unless it is reconstructive. If you need jaw surgery, we will work with you to determine the best way to finance it if your insurance does not provide coverage. To learn whether jaw surgery could improve your appearance, health and/or everyday living, call Wilmington Oral Surgery at any time.